It’s the very reason why Cardi threw hands on Nicki in the first place. Minaj allegedly ‘liked’ a similar post this past weekend. 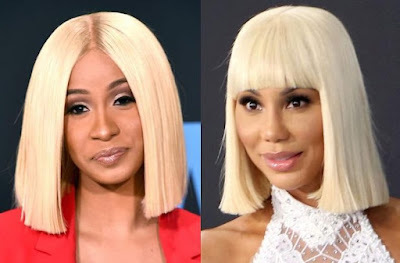 Fans online blasted Tamar, calling her “fake” as she is friends with Cardi’s little sister Hennessey. The two were pictured together in Los Angeles a few weeks ago after attending an event together. Yesterday, Tamar Braxton was dragged online after ‘liking’ a post where a woman blasted Cardi as a “bad mom” for fighting Nicki Minaj. The vlogger claimed that fighting on the red carpet could have landed the new mom in jail. When Cardi fans saw that Tamar had ‘liked’ the post on Twitter, she was immediately confronted by the Bardi Gang. Tamar quickly deleted ‘unliked’ the post – but of course someone took a screenshot. Cardi fans accused Tamar of being “jealous” of the ‘Bodak Yellow’ rapper and being just as shady as Nicki Minaj.